Divers create a photomosaic of a Roman shipwreck. Credit: V Mentogianis. A joint Greek-American archaeological expedition, co-directed by a University of Southampton researcher, has recorded 22 shipwrecks over 13 days in what may be the ancient shipwreck capital of the world. 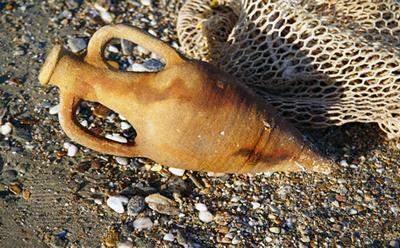 The findings in the Fourni archipelago in the Greek Islands bring to light ancient trade networks that once connected the entire Mediterranean. The wrecks date from the Archaic Period (700-480 BC) through the Late Medieval Period (16th century). Several date to the Classical (480-323 BC) and Hellenistic (323-31 BC) periods, but over half of the wrecks date to the Late Roman Period (circa 300-600 AD). The ships’ cargos point to the importance of long distance trade between the Black Sea, Aegean Sea, Cyprus, the Levant, and Egypt – in all these periods. “What is astonishing is not only the number of the shipwrecks, but also the diversity of the cargos, some of which have been found for first time,” says Greek director George Koutsouflakis. At least three of the sites have cargos that have not been found previously on shipwrecks. Archaeologists mapped each wreck using photogrammetry to create 3D site plans. Representative artefacts were excavated and raised from each wreck site for scientific analysis. These artefacts are primarily amphoras, which were terracotta jars that carried bulk goods prior to the invention of wooden barrels. The finds are currently undergoing conservation at the Ephorate’s laboratory in Athens and may go on displays in museums in the future. A small amphora for luxury goods. Credit: V Mentogianis. Fourni is a collection of thirteen islands and islets located between the eastern Aegean islands of Samos and Icaria. The small islands never hosted large cities, instead their importance comes from their critical role as an anchorage and navigational point in the eastern Aegean. Fourni lies along a major east-west crossing route, as well as the primary north-south route that connected the Aegean to the Levant. This is the first underwater archaeological expedition to the islands. The project’s success has come through working with local sponge divers, fishermen, and free divers together with technology and archaeological methods. 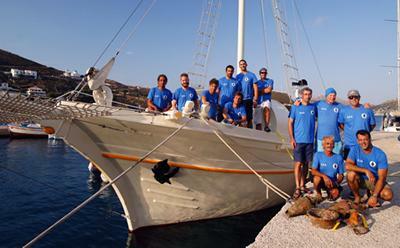 The expedition was a collaboration between the Greek Ephorate of Underwater Antiquities (EUA) and RPM Nautical Foundation (RPMNF), directed by George Koutsouflakis (EUA), Jeffrey Royal (RPMNF), and Peter Campbell (RPMNF/University of Southampton). Funding was provided by the Honor Frost Foundation, a UK charity that supports research in the eastern Mediterranean through an endowment from pioneer maritime archaeologist Honor Frost. Sponsors included Carrefour Ikaria, Eurobrokers, and the Municipality of Fourni Korseon. The 2015 expedition team. Credit: V Mentogianis. For comparison, the United States recently created a national marine sanctuary in Lake Michigan to protect 39 known shipwrecks located in 875 square miles. Fourni now has 22 known shipwrecks in 17 square miles. 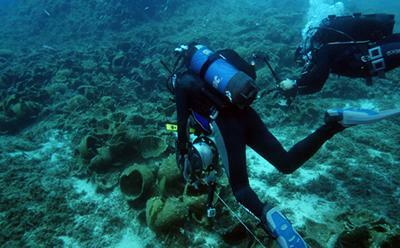 The previous record in Greece for a season was 10 ancient wrecks discovered over 10 days during a 2008 survey in Chios. Less than five per cent of Fourni’s coastline has been explored for underwater cultural heritage. Local fishermen and sponge divers have reported many more leads that will be followed up in future seasons. The team plans to return next year.